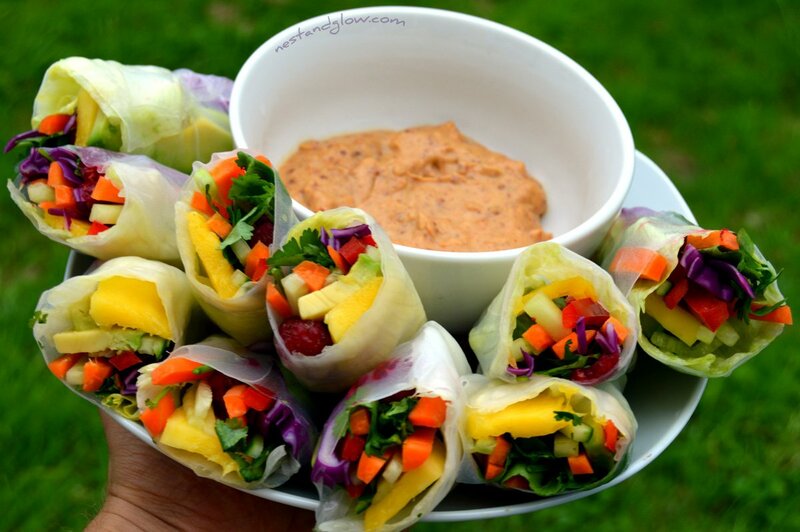 These summer rolls are fun to make and look very tempting. Filled with a rainbow of fresh raw fruit and vegetables. You can use any fruit or veg that you have – the only ingredient I always add is avocado. Some people avoid peanuts and the sauce can be made with any other nut or seed butter. I’ve made it with cashew butter, almond butter and raw sunflower seed and all have turned out great. I think it’s best with almond butter. Using peanut butter in the photos and video just as it’s the most common. Chop all fruit and vegetables into thin strips, apart from small fruit like berries. Dip a sheet of rice paper in warm water for a few seconds. Remove from the water when it begins to soften but still has some shape. Place flat on a board and then add thin slices of fruit and vegetables on 1/3 of the paper at an edge. Mix all of the satay ingredients together until they are combined. You may want to add more / less cayenne pepper depending on how spicy you like it. These impressive rainbow summer rolls are easy to make. It’s important to cut your fruit and vegetables into thin strips apart from the berries. Only soak the paper for a few seconds and take out when it’s still slightly rigid – it will soften more after taking out of the water. 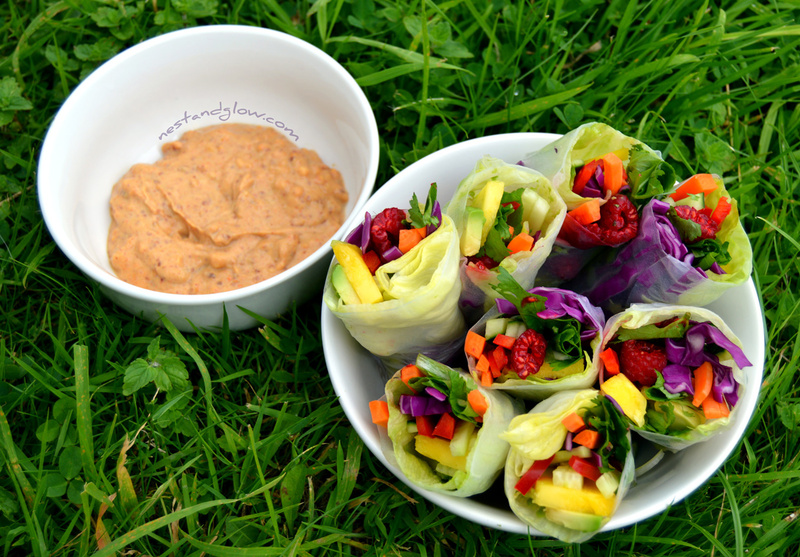 These summer rolls are the perfect colourful mix of vegetables and fruit. 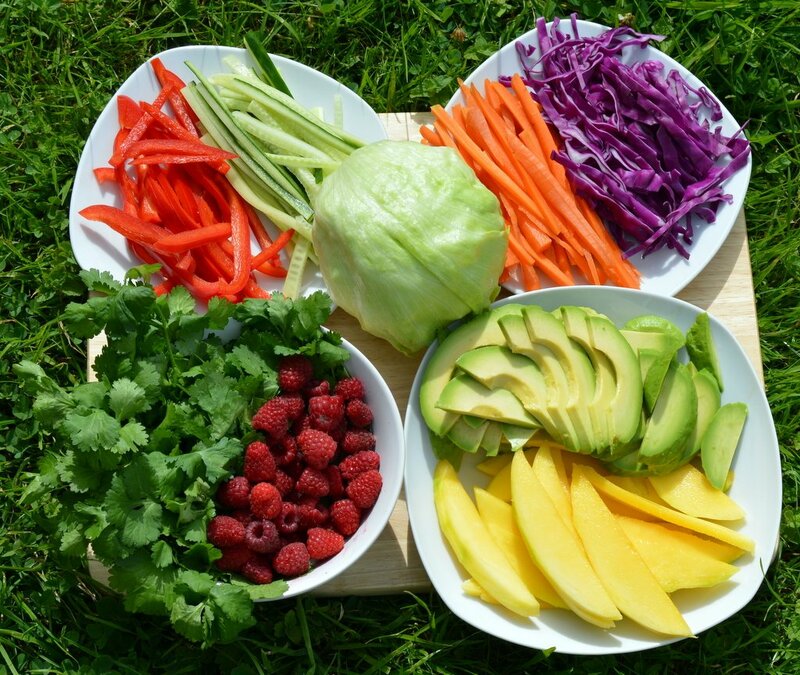 As each different type of fruit and vegetable has a different nutrient profile it is important to eat a rainbow diet. The current advice is to 10 different types of fruit and veg a day so these rainbow rolls will help you on your way. Rice paper is used to wrap these rolls up. It’s available from large supermarkets and from ethnic stores. To make a 100% raw food version you can use sprouted almond butter instead of peanut butter and raw coconut rolls made from the flesh of mature coconuts. Great summer and easy recipe! I love that you’ve put cilantro in, so original ???? I like your style. Would love to hear how you broke away from the corporate world to live the simple life. Thanks! Ooooh yummy! I have rice paper in the cupboard. was looking for something to make with them. Thanks you for the recipe!